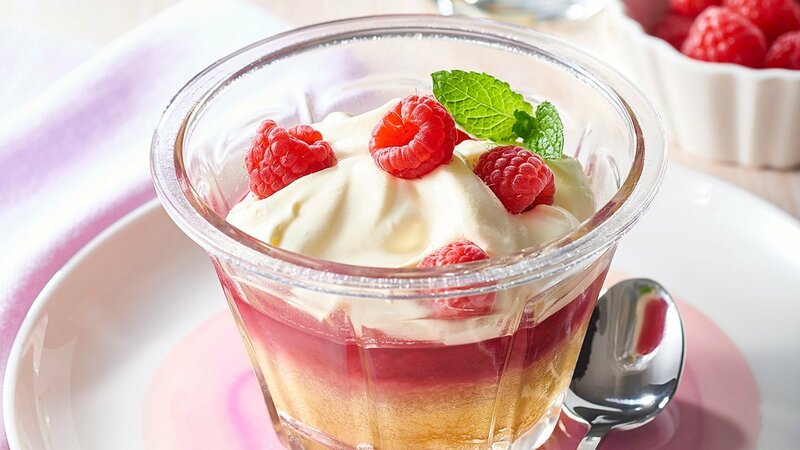 Give your residents a real fruit jelly by adding a new twist to an old favourite recipe. Bring water to the boil and add raspberries. Cool slightly then blend and strain, discarding the seeds. Whisk in the CARTE D'OR Pannacotta Dessert Mix. Slice the sponge roll and lay on a lined tray before pouring over the pannacotta mixture. Refrigerate until set. Once set, whip the cream and spoon or pipe over the top. Serve in individual portions, garnished with fresh berries. This dessert will present well in glasses as shown.